Reflectance Transformation Imaging. Jones and Smith. Internet Archaeol. 44. RTI is a process that is increasingly being applied to the analysis of a wide range of objects for the purpose of deciphering elements of their creation and use that otherwise would be invisible to the naked eye, or very hard to see without the aid of a microscope. RTI is increasingly used by archaeologists and historians in many different scenarios, including the investigation of ancient manuscripts, inscriptions, fossils, graffiti, statuary and graveyards. In our case we have found it invaluable for the study of tombstones and monuments (Beale and Beale 2012). The technique described in this article uses polynomial texture mapping to produce photorealistic outputs from multiple images of an object that has been lit from several directions during capturing. The artificial lighting of an object from multiple directions enables the creation of maps of surface details through shadowing and reflections (Malzbender et al. 2001). In the instance of Dame Mary May's tomb, polynomial texture maps (PTM) of the surfaces of the monument were planned in order to contribute visual evidence to the debate around the treatment of the effigy of May post-mortem. When viewing an interactive RTI file, the light on the surface of the object photographed can be manipulated manually, allowing us to see things not easily visible in individual images of an artefact. The technique is often described as compiling the views of many raking light photographs of the surface of an object into one image. Raking light photographs highlight particular details on the surface of an object because light shone across a plane creates long shadows on the surface at that particular point, highlighting directional details. Although RTI results do not actually combine multiple raking light photographs into one image, they do enable the viewing of light-related information from several photographs in one interactive file. Despite the viewing software (in this case, RTIViewer was used) presenting the PTM file as an image with a moveable light source, RTI files are not actually a literal view onto a collection of overlaid photographs. Instead, PTM files are mathematically enhanced files that are made up of the reaction to light of surface shapes and of the materials of the object being recorded as captured by the camera lens. The software used to create a PTM for the recording of the May tomb (RTIBuilder) calculates the directionality of the light-source for each single pixel in every photograph, producing from this a surface normal for the pixels. This information is combined to create the final file. RTIViewer then allows users to move a virtual light around the screen, illuminating the pixels that make up the image seen, in order for a visual representation of the information about the captured object to be presented to the user. In addition, various enhancements can be applied to the RTI file to reveal surface information that cannot be seen easily with the naked eye. Particularly useful for the case of Dame Mary May's tomb is the function that enables specular enhancement of pixels in order to enhance how the shapes of the surface of the object are perceived by increasing the reflectance properties of each pixel in relation to the pixels around it. The output file (PTM) is stand-alone and therefore can easily be shared. The benefits of this are reported towards the end of this article. As the viewing software is free, this represents a new way to share information about objects. Practically, RTI works by taking a hemispherical selection of photos from a fixed camera point by means of a series of multiple light captures. In some cases, especially for smaller artefacts, it is possible to construct a dome fitted with a network of between 50 and 74 LEDs. In this use-case, a light position (lp) file is used that has fixed coordinates for each LED. 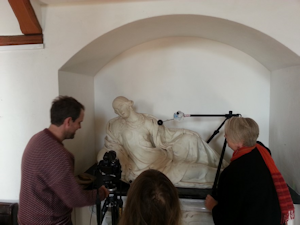 In the field, particularly in the case of larger, immoveable objects such as the Dame Mary May tomb, a single portable light device such as a camera flash gun or a bright LED torch is used as a hand-held light source. This light source can be moved round the object in order to take between 50 and 70 individual photographs. This method is called Highlight-RTI and is increasingly popular in the area of graveyard recording due to its portability and scalability (see Beale and Beale 2015 and also http://britishmemorial.org/). The highlight part of the name of the technique points to the way in which the output is produced. A spherical ball with a reflective surface provides a static point in each shot, and a highlight is produced from the portable light source on the surface of the ball. This is used to calculate the directionality of the light for each image. Figure 7 shows the basic set-up used for the Mary May RTIs. Figure 7: The team setting up an RTI. When working in St Nicholas, the team processed each RTI in turn in order to analyse and interpret results as part of an iterative development. The results were viewed on a laptop in the church and details were discussed in order to identify the next areas for focus after each stage of recording. The following sub-headings report on the results of each point of the process of recording, analysis, and interpretation of the PTMs in turn.